A corn is the thickening of the surface layer of the skin. 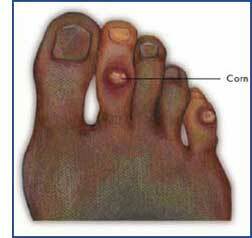 Corns usually form on the top of toes, the tip of toes and between the toes. Corns are more common in women than men. This is because women wear tight-fitting shoes, socks and stockings more often than men do. Yes. There are many different treatment options for corns. Orthotics to deflect pressure away from the lesions. Medications, such as ibuprofen may temporarily relieve the pain and inflammation. A change in footwear or use of padding to prevent pressure can also prove effective. In some cases, surgical correction is required. Modification of footwear and mechanical reduction of the corns may also be indicated. How is a callus formed? 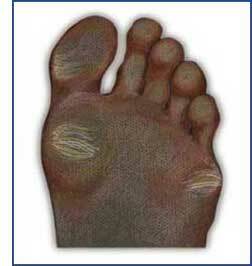 Calluses develop because of excessive pressure on a specific area of the foot. Yes. Treatment will depend on the cause of the callus. Applying non-medicated pads around the callus will relieve pressure. Custom foot orthotics can be sued for deflection of the area. Do not try to treat them by cutting or trimming them with a razor blade or knife. This is dangerous and can worsen them.